Students, faculty and administrators at Mount Vernon High School had an opportunity to celebrate their cultural heritage during the recent “Awareness and Resilience” Hispanic Heritage Month Celebration. The school marked the occasion by “celebrando el patrimonio cultura” in Spanish and “comemorando o patrimônio cultural” in Brazilian Portugese. 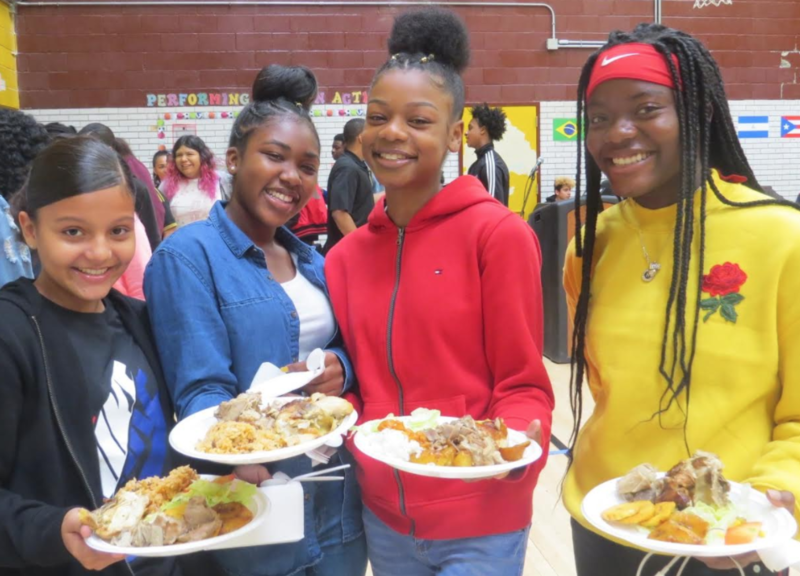 All students had an opportunity to commemorate their personal heritage in an gathering which featured food, dance and an opportunity to offer donations to those affected by the recent Mexican earthquake and Hurricane Maria. Ray Sanchez, superintendent of the Ossining Union Free School District, offered comments during his keynote address to students. Principal Ronald Gonzalez endorsed Sanchez’s comments as he traveled about the room chatting with students, noting the school’s diversity makes it an even stronger and more vibrant place to learn. Later, he proudly read “I’m a Rican,” using the spoken word method of reading the poem to the almost 200 students in attendance. Students said they appreciated the afternoon, which featured musical entertainment by the Afro Latin Jazz Alliance, an information session by the National Hispanic Institute, Latin dance lessons by the Arthur Murray Dance Studio and a Latin American-themed buffet luncheon featuring chicken, beans, rice and plantains and assorted desserts. Student Marcio Dalves liked having the opportunity to celebrate the culture of his native Brazil. “We’re recognizing what Latin Americans have done for this country and we celebrate that today,” Mori added. Also sitting with them was student Sabrina Passoni,who emphasized one’s heritage is important, no matter where one’s origins are. Chicken, rice, beans and plantains were buffet highlights for these Mount Vernon students who attended the celebration.